Sisterhood is forever. Wear a reminder of your special bond with BB Becker's handmade sterling silver design. Back in the day, she stole your clothes and wore your lipstick without asking. Fast forward all these years, she's the one you call on a tough day. That's the beauty of sisterhood. 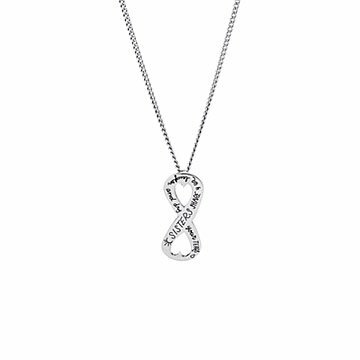 Wear a reminder of your bond with this sweet infinity necklace. BB Becker handcrafts the piece from sterling silver, etching the heart-warming phrase, "Sisters share your laughter and dry your tears." Send the beautiful piece to your sis or a best friend (they count as sisters, too!) to say thanks and let her know you'll always be there. Designed in Colorado. Pendant: 1.1" L x .5" W; Chain: 20"